On 8th August, Lluís Compte’s work as Laia Foundation representative was recognised by The Academy of Ecumenical Indian Theology and Church Administration. 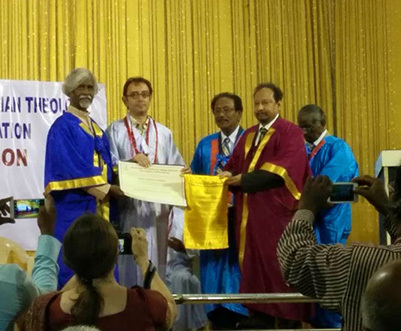 He was awarded the degree of Doctor of Divinity, Honoris Causa for his support to disadvantaged communities in the South of India. The ceremony evoked the origins of Laia Foundation by remembering Laia Mendoza who, alongside Lluís Compte, helped the tsunami victims in December 2004 by raising funds to build more than 100 homes and buy 5 fishing boats. The ceremony also recognised Ms. Sivakami Palanimuthu’s contribution to society, in particular the foundation of theDalit Land Rights Movement in 2004 and the political party Samuga Samatuva Padai in 2008 with the aim to empower both women and the Dalit community. Father Jayaseelan was also awarded the degree of Doctor of Divinity Honoris Causa for his service to the church and society. Father Jayaseelam, having been himself a victim of discrimination for his Dalit condition, devoted his life to empower Dalit boys and girls mainly through education.